Victorville is a city located in the Victor Valley of western San Bernardino County, California, USA. According to the U.S. Census Bureau's 2000 census, the city has a total population of 64,029. The May 1, 2007 population estimate from the State of California Department of Finance is 102,538. Victorville is located at 34°31'14" North, 117°20'40" West (34.520459, -117.344525)GR1. 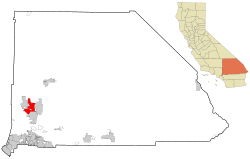 It is bordered by Apple Valley on the east, Hesperia on the south, and Adelanto on the west. The Mojave River flows through Victorville. The elevation at City Hall is approximately 2,950 feet above sea level. The summer climate for this area in the Mojave Desert may be hotter than the Los Angeles basin or the Inland Empire, but actually 10 or 15 degrees cooler than in the Colorado Desert. As of 2005, there is an estimated population of 86,473 people, 30,000 households, and 21,000 families residing in the city. The population density is 339.7/km² (879.7/mi²). There are 22,498 housing units at an average density of 119.4/km² (309.1/mi²). The racial makeup of the city is 61.05% White, 11.92% African American, 1.11% Native American, 3.48% Asian, 0.20% Pacific Islander, 16.26% from other races, and 5.98% from two or more races. 33.46% of the population are Hispanic or Latino of any race. There are 30,000 households out of which 43.8% have children under the age of 18 living with them, 54.3% are married couples living together, 16.1% have a female householder with no husband present, and 24.0% are non-families. 19.4% of all households are made up of individuals and 8.5% have someone living alone who is 65 years of age or older. The average household size is 3.03 and the average family size is 3.47. In the city the population is spread out with 34.2% under the age of 18, 8.6% from 18 to 24, 28.6% from 25 to 44, 17.4% from 45 to 64, and 11.2% who are 65 years of age or older. The median age is 31 years. For every 100 females there are 93.9 males. For every 100 females age 18 and over, there are 89.2 males. The median income for a household in the city is $36,187, and the median income for a family is $39,988. Males have a median income of $40,149 versus $26,138 for females. The per capita income for the city is $14,454. 18.7% of the population and 15.3% of families are below the poverty line. Out of the total population, 24.6% of those under the age of 18 and 10.6% of those 65 and older are living below the poverty line. About 1895 the town was named Victor after California Southern Railroad General Manager Jacob Nash Victor. In 1901, the United States Post Office Department changed the name to Victorville to avoid confusion with the town of Victor, Colorado. In 1926, Route 66 was established and passed through Victorville. Today, the former route is the primary road through oldtown Victorville, forming Seventh Street. Victorville Army Airfield was constructed in 1941 and later named George Air Force Base. The city was incorporated on September 21, 1962. On August 14, 1977, actor Ron Haydock was struck and killed while hitch-hiking near Victorville. Ron Haydock is also remembered for his hit rockabilly 45rpm single "99 Chicks". The punk band C.U.R.S.E. formed in Victorville in 1985. The punk band Futile Effort formed in Victorville in 1989. The members of Face to Face (Victoria Manor) used to watch Futile Effort play and tell the band that "punk was going nowhere". The punk band Face to Face formed in Victorville in 1991 after cutting their hair and changing their heavy metal band, Victoria Manor, into a punk band. In 1992, George AFB was deactivated and is now Southern California Logistics Airport. The former base housing is now vacant, forming a ghost town that is used for military training purposes by troops from Fort Irwin Military Reservation. In 2003, the Roy Rogers and Dale Evans Museum was moved from Victorville to Branson, Missouri. Earl W. Bascom, Hall of Fame cowboy, international artist and sculptor. Trent Brendon, tennis player, Wake Forest University career wins leader. Ollie Butler, Legendary High School Basketball Coach from Victor Valley High School. Cuba Gooding, Jr., actor (actually from Apple Valley). Dan Henderson, welterweight champion, was born in August 24, 1970 and went to Victor Valley High School. T. J. Houshmandzadeh, wide receiver for the NFL's Cincinnati Bengals. Ron Johnson, bass player for Karl Denson's Tiny Universe and New Monsoon (actually from Adelanto). Dave Lombardo, drummer of thrash metal band, Slayer. Prem Reddy, MD, FACC, FCCP, Cardiologist, Entrepreneur and Philanthropist. Joe Stevenson, ultimate fighter who attended Silverado High School. Victorville is the current home of the Route 66 Museum and the San Bernardino County Fair. The United States Penitentiary, Victorville, located north of I-15 just off US Highway 395 has been home to many notables, including John Walker Lindh, the so-called "American Taliban" fighter. "Grand Theft Auto" (1977) starring Ron Howard was filmed in Victorville, California. The film The Hills Have Eyes (1977) was filmed in Victorville, California, but the remake which was made in 2006 was eventually filmed in Morocco. The film The Fast and the Furious: Tokyo Drift (2006) was partly filmed in Victorville, California. ^ Victorville City Council: Councilmember Terry Caldwell. Retrieved on 2007-02-20. ^ Incorporation Dates of California Cities. Retrieved on 2007-02-20. ^ Victorville city, California - Fact Sheet - American FactFinder. Retrieved on 2007-02-20. ^ USPS - ZIP Code Lookup - Find a ZIP+ 4 Code By City Results. Retrieved on 2007-02-20. ^ Number Administration System - NPA and City/Town Search Results. Retrieved on 2007-02-20.